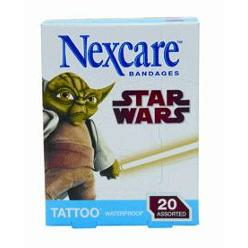 Tattoo Waterproof Bandages. 20 bandages total. Ultra-thin, clear, breathable material. Unique bandage shape is designed for better seal around the pad. (10) spot bandages. (10) 1-1/16 in x 2-1/4 in.